In the last 40 years, less-educated workers in most advanced economies have experienced a sustained fall in real wages. (Dustmann et al. 2009, Acemoglu and Autor 2011, Blundell et al. 2018). 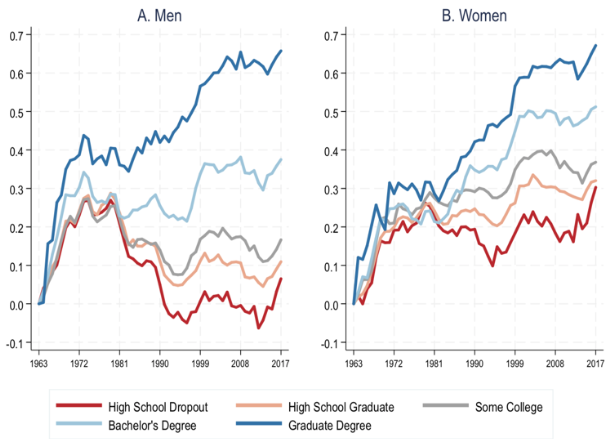 In the US, for example, wages have risen robustly among the most-educated workers, but since 1980 they have fallen in real terms among men with no college education (Figure 1). Source: Autor (2019), based on Current Population Survey (CPS) Annual Social and Economic Supplement. There are many potential explanations for this, including eroding union penetration and bargaining power, falling federal and state minimum wages, rising trade pressure stemming from China's rise as a manufacturing power, and changes in employer practices that decouple the wages of less-educated workers from the productivity and profitability gains of their employers (Card 1996, Lee 1999, Autor et al. 2013, Weil 2014, Autor et al. 2016). In recent work (Autor 2019), I document another force that has contributed to the declining fortunes of less-educated workers: the rapid erosion of middle-skill employment – both production work and administrative and clerical work – among non-college workers in high-wage urban labour markets. Many readers will be familiar with the occupational polarisation that has reshaped the landscape of work among less-educated workers: CPS data tell us that in 1980, US employment of non-college workers was roughly split between low- and middle-skill occupations, with 42% in the former category, 43% in the latter, and the remaining 15% in high-skill occupations. Broadly, these groups are: (low-skill) service and manual occupations; (mid-skill) production, office, administrative, and sales occupations; and (high-skill) technical, professional, and managerial occupations. In the intervening (nearly) four decades, the share of non-college employment in middle-skill occupations fell from 43% to 29%. The share in high-skill occupations increased only slightly (15.4% to 16.8%), and so most of the decline in non-college middle-skill employment is proximately explained by the movement of non-college workers into traditionally low-educated, low-paid work. In contrast, for college-educated workers, the decline in middle-skill employment has resulted in an equal outflow into high- and low-skill occupations. But does occupational change explain the post-1980 divergence in real wages by education (see Figure 1)? A short answer is no. A simple counterfactual exercise that holds the occupational wage structure fixed while allowing the distribution of workers by education and gender to shift across occupations as occurs in the data shows that only a small fraction of the divergence in the data is accounted for by simple movements of education and gender groups across occupations. Thus, changing occupational composition cannot by itself explain most of the evolution of wage inequality between groups. Something else is happening. The structure of work differs systematically across places, and one of the key predictors of occupational structure is population density. Some activities, such as agriculture, naturally take place in low-density areas, but knowledge-intensive industries tend to locate in cities, where educated workers are most concentrated (Glaeser and Mare 2001, Moretti 2004, Berry and Glaeser 2005). In the decades following WWII, there was a steep positive urban gradient in the skill and wage levels of workers in non-college jobs in the US. Non-college urban adults disproportionately held middle-skill, blue-collar production and white-collar office, administrative, and clerical jobs. These workers laboured in close collaboration with the high-skill, urban professional, managerial, and technical workers who oversaw factories and offices. This meant that middle-skill jobs for non-college workers were prevalent in cities and metropolitan areas, but scarce in suburbs and rural labour markets. Figure 2 depicts the aggregate relationship between population density and occupational structure at the level of 722 commuting zones (CZs) covering the contiguous US states between 1970 and 2015. The horizontal axis is the natural log of population density (the number of residents divided by CZ land area). For consistency, I used each zone's population density in 1970 throughout, and the data are weighted by the count of working-age adults in each CZ. Each plotted point in the bin-scatter represents approximately 5% of all workers in each year. The rising set of upward-sloping curves in the right panel show that while denser CZs have traditionally been more intensive in high-skill work, the level and slope of this relationship between density and skill-intensity has risen consistently over multiple decades. 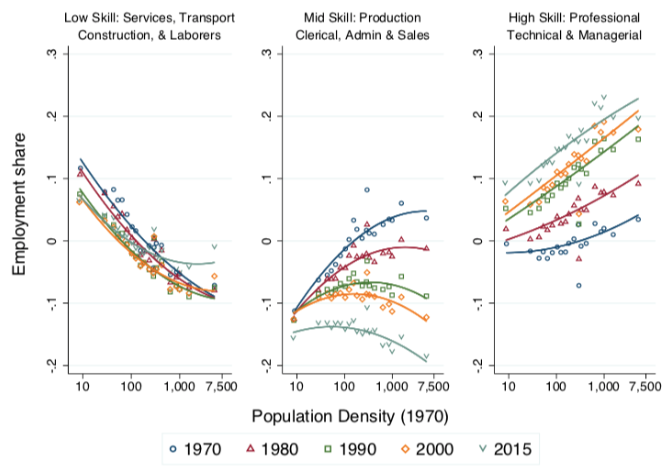 The overlapping downward-sloping curves in the left panel show that the fraction of workers engaged in low-skill occupations has historically been much smaller in high-density CZs, and this pattern has changed little over decades. In the middle panel, the fan-shaped set of curves show that the denser CZs were exceptional in the 1970s for having far more middle-skill work than suburban and rural CZs. But this exceptional feature attenuated. By 2015, the densest CZs had less middle-skill work than the suburbs or rural areas. Source: Autor (2019), based on US Census for 1970, 1980, 1990, and 2000, and pooled American Community Survey data for 2014-2016. We can decompose this into the different experiences of college-educated and non-college-educated adults (Figure 3). For college-educated adults, there was a decline of about eight percentage points in the share of college workers working in middle-skill occupations, and this shift was most pronounced in denser CZs. For non-college workers, at no point was there any meaningful density gradient in high-skill work among non-college workers. But in 1970 non-college workers in the densest CZs were approximately 25 percentage points more likely to work in middle-skill occupations than those in low density CZs. By 2015, the low-skill employment share among non-college workers was several points higher in the most- versus the least-dense CZs, while the middle-skill employment share was several points lower. Where have all of these middle-skill jobs gone? Two secular demand-side forces have contributed substantially to their disappearance (Autor and Dorn 2013, Autor et al. 2016, Acemoglu and Restrepo 2017): one is the decline of manufacturing production work in the face of automation and rising trade pressure; the second is the proliferation of increasingly capable and user-friendly office computing tools that have reduced demand for workers in routine office tasks. While manufacturing had already departed the densest urban areas by the 1970s, the march of office computing has been particularly significant for urban, non-college workers. In 1980, the share of non-college workers in clerical and administrative occupations was 15-plus percentage points higher in the most versus least dense CZs. As office computing capabilities advanced, clerical and administrative employment among non-college workers fell steeply from the 1980s onwards. By 2015, there was almost no remaining (positive) density gradient in office work among non-college workers. It is a robust empirical regularity that urban workers earn more than observably similar non-urban workers (Glaeser and Mare 2001, Moretti 2004, Glaeser and Resseger 2010). Given that land prices are intrinsically higher in dense locations, it is logical that higher urban wages compensate workers for the higher cost of urban living (holding amenities constant). For this to be an equilibrium, however, the productivity of urban workers must also be commensurately higher; otherwise, firms would locate elsewhere. It is easy to imagine why urban productivity is greater for highly educated workers. In knowledge-intensive work, in-person interactions appear to have few close substitutes, meaning that proximity is critical. It is less obvious, however, why these productivity spillovers accrue to less-educated workers – but historically they clearly did so. One possibility suggested by the evidence above is that, in past decades, less-educated workers performed higher-skilled work in urban areas – specifically, production, clerical, and administrative jobs. If so, the secular decline of middle-skill urban occupations might have served to depress the urban wage premium among non-college workers. Figure 4 shows that this has indeed occurred. Between 1990 and 2015, the urban wage premium among non-college workers declined by roughly two thirds, even as the urban wage premium among college workers steepened. A similar pattern is documented by Baum-Snow et al. (2018). 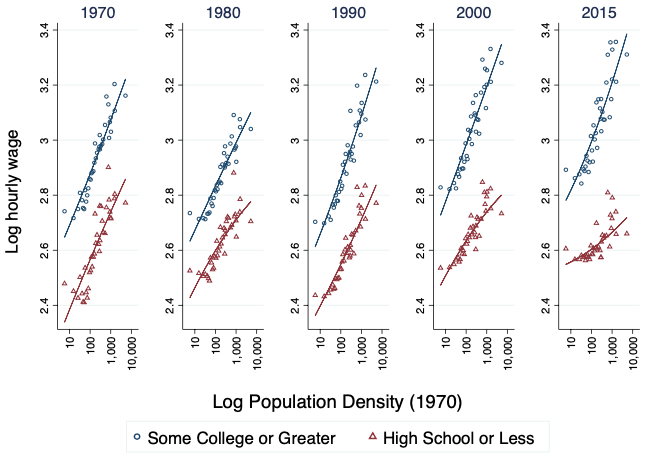 As I demonstrate in Autor (2019), this striking pattern is not driven by other obvious confounds such as changes in age structure in urban areas, shifts in the educational composition of the broad ‘non-college' category, lingering after-effects of the Great Recession, or artefacts of the rising immigrant share of urban workers. Rather, it appears to be a genuine change in urban wage structures. In short, occupational polarisation has disproportionately occurred in high-wage urban and metro labour markets, and it appears likely that the geography of polarisation has magnified its wage impacts. Non-college workers in US cities perform substantially less skilled work than they did four decades ago. This change reflects the effects of automation and, to a lesser degree, international trade, which have eliminated the bulk of non-college production, administrative support, and clerical jobs, yielding a disproportionate polarization of urban labour markets. The unwinding of the urban non-college occupational skill gradient has shunted non-college workers out of specialised middle-skill occupations into low-wage occupations, diminished the set of non-college workers that hold middle-skill jobs in high-wage cities, and attenuated the steep urban wage premium for non-college workers that prevailed in earlier decades. 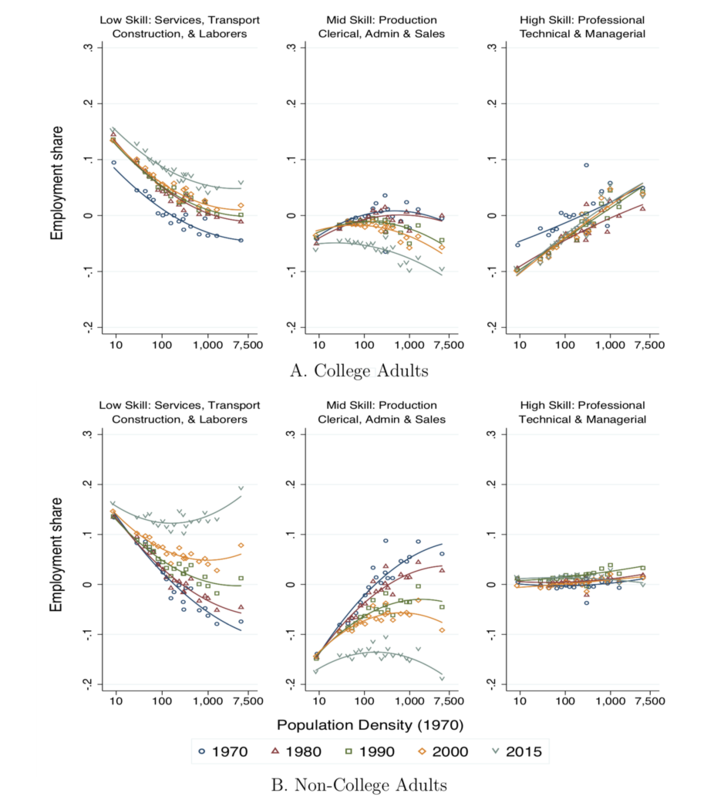 Changes in the nature of work – many of which are technological in origin – have been more disruptive and less beneficial for non-college than college workers. Acemoglu, D and D H Autor (2011), "Skills, Tasks and Technologies: Implications for Employment and Earnings," in Handbook of Labor Economics 4, Elsevier. Acemoglu, D and P Restrepo (2017), "Robots and Jobs: Evidence from US Labor Markets", NBER working paper 23285. Autor, D (2019), "Work of the Past, Work of the Future", NBER working paper 25588. Autor, D H, D Dorn, and G H Hanson (2013), "The China Syndrome: Local Labor Market Effects of Import Competition in the United States", American Economic Review 103(6): 2121–2168. Autor, D H, D Dorn, and G H Hanson (2016), "The China Shock: Learning from Labor Market Adjustment to Large Changes in Trade", Annual Review of Economics 8(1): 205–240. Baum-Snow, Nathaniel, Freedman, Matthew, and Pavan, Ronni, "Why Has Urban Inequality Increased? ", American Economic Journal: Applied Economics 10(4): 1-42. Berry, C R and E L Glaeser (2005), "The Divergence of Human Capital Levels Across Cities", Papers in Regional Science 84(3): 407–444. Blundell, R, R Joyce, A Norris Keiller, and J P Ziliak (2018), "Income Inequality and the Labour Market in Britain and the US", Journal of Public Economics 162: 48–62. Card, D (1996), "The Effect of Unions on the Structure of Wages: A Longitudinal Analysis", Econometrica 64(4): 957–979. Dustmann, C, J Ludsteck, and U Schonberg (2009), "Revisiting the German Wage Structure", The Quarterly Journal of Economics 124 (2): 843–881. Glaeser, E L and D C Mare (2001), "Cities and Skills", Journal of Labor Economics 19(2): 316–342. Lee, D S (1999), "Wage Inequality in The United States During The 1980s: Rising Dispersion Or Falling Minimum Wage? ", The Quarterly Journal of Economics 114(3): 977–1023. Moretti, E (2004), "Estimating the Social Return to Higher Education: Evidence from Longitudinal and Repeated Cross-Sectional Data", Journal of Econometrics 121(1-2): 175– 212. Weil, D (2014) The Fissured Workplace, Harvard University Press.